Indigenous art of the Northwest Coastal Indians has its origins in the geographic area covering Northern California to Southwestern Alaska. Some familiar tribes include the Chinook, Tlingit, Haida, Coast Salish, Tsimshian, and Quileute. Categorized by such iconic art forms as totem poles, ceremonial masks, basketry and carved panels, this art is defined by the use of bold, stylized shapes and distinct colors. Common subjects include animals, humans, and mythological interpretations incorporated as often to satisfy superstitions, as to honor events or individuals. Indian art of the Northwest Coast has been identified as far back as 6000 years ago. It is thought that the long months of winter offered these tribes the opportunity to devote this time to their ceremonial traditions and the creation of this symbolic and highly representational art. The artifacts served both function and aesthetics and were utilized for practical as well as ceremonial purposes. 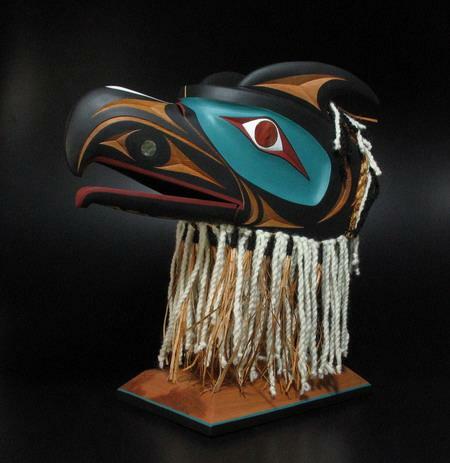 Masks and totem poles are perhaps most synonymous with Northwest Coast Indian art. Cedar, native to the area was readily available and most often used in carving. 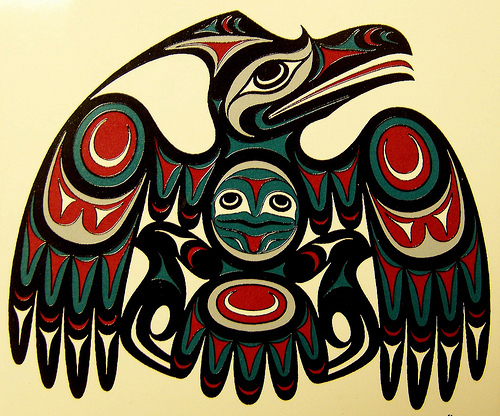 Common animal subjects in all tribal art forms included ravens, eagles, killer whales, and salmon. These were often depicted as mythological entities, illustrating the transcendence of earthly attributes. The raven was considered of great importance and thought of as something of an imposter, with the ability to mimic other forms. The eagle’s size and power, symbolized social status and prestige, as well as peace and friendship. Whales and salmon were also familiar motifs. Whales became the subjects of stories handed down by the tribal elders and illustrated through art. Salmon, an abundant food source, were also honorably portrayed. Native American art of the coastal Indians is unique to this part of North America and has a history rich in lore and tribal traditions. If you are interested in learning more about Northwest Coast Indian art, we are lucky to enjoy fantastic collections in both the Portland Art Museum and Seattle Art Museum. 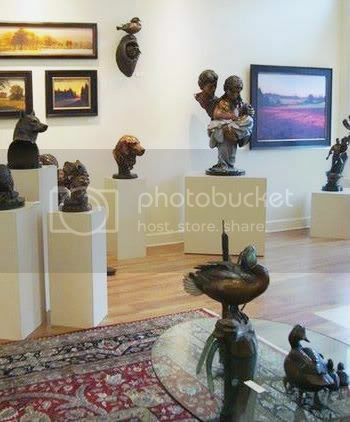 If you’re attending First Thursday, be sure to visit Quintana Galleries. This gallery has specialized in Native American art, including Northwest Coast Indian art for 40 years in the Portland area. 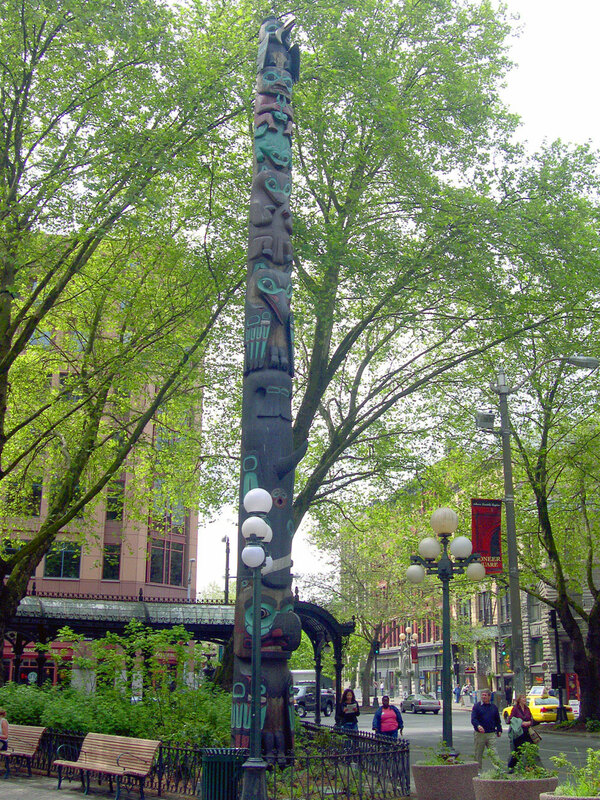 If you would like to view authentic totem poles, put Pioneer Square in Seattle on your list; and if you find yourself in Victoria, BC, Thunderbird Park at the Royal BC Museum. 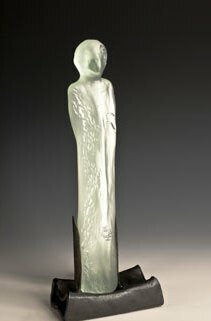 Even closer to home, we will be showing the sculpture of Alaskan artists Jacques and Mary Regat during the month of October. 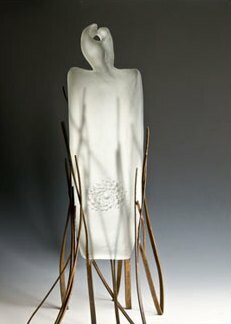 The work of these fine artists reflects their love of Alaskan culture and heritage. Jacques and Mary will be in the Gallery on First Friday, October 5 to share their art and enjoy the festivities. Be sure to put it on your calendar!